Just my thoughts..: Exit College, Enter? My project’s final review is over and along with it ends my college life. But I haven’t had time to rest or be sad about it because, I’m neither at home nor lonely. In fact, I’ve been busy meeting some of the people who were a major part of my gaming career. First, it was Ganesh anna, who was our guru when we first started dreaming of professional gaming. He wasn’t with us for long but he definitely had a huge impact on all of us (Gdn). He had to move on with his life & so, we parted ways before we could accomplish much. We do still keep in touch & we still share some passion for gaming (especially DotA). Finally, we managed to have a get-together with him as a team. 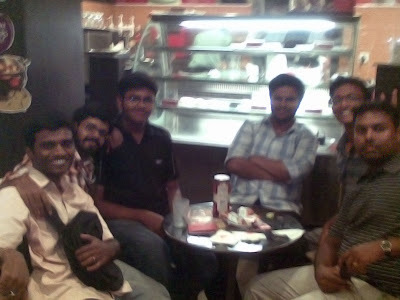 Unfortunately, Raja aka Arch3r & Karthik aka fRosT weren’t there, but it was a memorable meet none-the-less. It has been years since he left us, but he hasn’t changed at all in all these years. He is still able to dream as if he was a child without any worries about reality; he still searches for ways to improve though there isn’t a visible target; he is still the most modest person you can come across in your life. Everyone meets some person in their life who really inspires them and to me, Ganesh anna is one of those inspirations. Below is a picture of our meet (Ganesh is the last person to the right). They say that there is a woman behind every man’s success. I say, in sports, there is a strong opponent behind every team’s success. In any sport, the best way to improve is to compete against someone. Without that someone to fight; without that someone to keep you on your toes; without that someone to make you stay on guard, you will become lazy. That is why, I consider the neighborhood DotA team, Atl as a major influence in our (Gdn’s) gaming career. When we first started, our aim was Agents (which was the best in Chennai back then) and after beating them, our aim moved on Roar (0mF). But 0mF was in a completely different league (simply put, better than us). We needed someone in our skill range to compete & improve. That is when Atl spawned. They were new to the scene and they were definitely below our standard when they started. But they too had a leader who could dream & keep saying that the impossible is easily possible. Eventually, they caught us up & gave us a run for our money. Planning strategies, coming up with tactics to beat their positive points, making decisions & finally playing them on a weekend with full enthusiasm, now that is what gaming is all about. Sadly, their leader too had to move on & so, we were left dry with no one to beat and no one to challenge us (something similar to what happened to 0mF). After months without a tournament, without a competition, without motivation we were struggling to survive. But now, they are back. The good old team is back along with their leader & we, have got a reason to fight. The picture below was taken when Atl visited our café (Zion) to play against us last week. 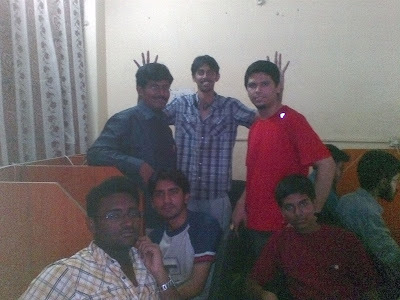 Clockwise from the left-bottom, Richard aka D.Jack, Sathya aka nofear86, Jeyakumar aka Assassin (their leader), Anand aka Vulcan and finally, Anwar aka piranha – these are the five that constitute Atl. There are a few more in the picture namely Richard aka Pulse (the kid at the bottom-right facing the camera), me & Ashwin aka Gladi busy on the computers. My college life is over and I’m not sure what is coming next. But for now, I don’t have time to think about it because, I’m busy reliving the best part of my gaming life. Yup, for me it is Ganesh Anna who inspired to tread this path of competitive gaming. I had always wondered what would be off the GDNs if he was there a bit long time. None the less, best part was, he was there even in his absence. @Bharath, yep, would've been interesting..
@Anwar, sure.. You are welcome..
@Vijay, lol! I still remember what you said when he offered to pay the bill..